Donna's Electrical are committed to raising the bar in the solar industry. You can have confidence when buying solar by choosing a Clean Energy Council Approved Solar Retailer. maintain a fair and transparent complaints process, and get back to you within 21 days of you making a complaintInfinite Energy has been a proud signatory to the Clean Energy Council’s (CEC) Solar PV Retailer Code of Conduct since early 2015. When speaking to our customers about our Approved Retailer Status we have come to realise that people are often confused by the different CEC accreditations and incorrectly think a Member or Accredited Installer is the same thing as an Approved Retailer. If you are thinking of purchasing solar for your home or for your business we highly recommend you continue reading so you can understand the difference and make an informed decision about the company you choose to buy from. Infinite Energy chooses to support the work of the Clean Energy Council by being a Corporate Member. This allows us to be part of the conversations that will drive Australia’s clean energy future and also gives us access to various working groups and industry briefings. Buying from a company that is a Clean Energy Council Member doesn’t provide you as a customer with any benefits or assurances. You can read more about CEC Membership here. Another term which can sometimes cause confusion is when someone says they are a CEC Accredited Designer and/or Installer. CEC accreditation is a qualification that demonstrates competence in design and/or installation of solar PV systems and is only available to individual solar PV system designers and installers, not organisations. In order to gain this accreditation, individuals must go through an accreditation process with the CEC which includes specific training units. To claim STCs on a solar installation, it must have been designed and installed by a CEC accredited installer. Given that every customer who purchases a solar PV system would want to take advantage of the Government incentives available, you are highly unlikely to find an installer that is not CEC Accredited. Needless to say, all of Infinite Energy’s systems are designed and installed by CEC Accredited Installers. Given that CEC accreditation is expected of all installers it is not something a solar provider should be using to distinguish themselves from their competitors (it would be like a taxi company telling you they are great because all of their drivers have driving licences…). You can read more about CEC Accreditation here. 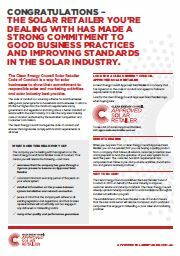 The Clean Energy Council Solar Retailer Code of Conduct is a voluntary scheme for solar retailers, enabling them to show their commitment to responsible sales and marketing activities and solar industry best practice. Authorised by the Australian Competition and Consumer Commission (ACCC), the code aims to lift the bar higher than the minimum requirements set by government and regulations and bring about a better standard of service within the solar industry. You can read more about the CEC Solar Retailer Code of Conduct here. Infinite Energy was awarded the Clean Energy Council's Approved Retailer Status in February 2015. We believe this recognition sets us apart from many of our competitors and is one of the many reasons you should choose Infinite Energy as your preferred solar power provider.